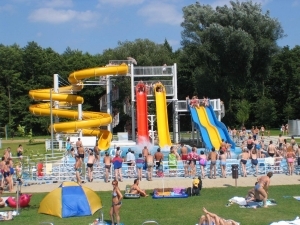 The medicinal resort town is situated 35 km fom Lake Balaton. Zalakaros earned an international reputation by the medicinal water of 96 °C found in 1962. The sulphur and iodine-bromine water coming from as deep as 2,000 m is suitable for curing locomotor, gynaecological and neurological diseases. The bath is open all year round offering new attractions every year. Apart from traditional medicinal pools, a popular indoor and outdoor fun bath, a swimming pool with artificial waves and a giant chute were built. In the bath you can find a medical centre and a therapy unit. The small town won the first prize at the Competition for Flowery Hungary in 2002. It is reflected in the townscape everywhere. You can see park woods, paths, well-kept lawn and flower beds all over the town. It is not crowded in spite of the nearly one million visitors every year, the structure of the town provides comfort and space for tourists. The town can offer programmes for almost every day, information can be found on the homepage of the town. Outstanding events include the Summer Cultural Festival of Karos, the Karos Cup International Chess Competition, and the Days of Town Karos. The Wine days are very popular, where visitors can try the wine of the town, the Tónai made from special local grapes. The city and its neighbourhood is excellent for active leisure time activities such as cycling, horse riding, fishing and hunting. Visitors can walk in the parks of the city, can walk along the trails of the Park forest ot take short or long hiking tours. For further information, please consult the local Tourinform Office in Zalakaros: Tel./fax: (93) 340 421, e-mail: zalakaros@tourinform.hu. For making a reservation please visit our hungarian site on Zalakaros and use those grey +-buttons.